To start our adventures we couldn't hope for anything better than having Veronica and Andrew as part of our crew. They came all the way from Australia to share with us the first week of our trip. On top of the happiness of having them with us they work hard and always give us a great deal of help. After many farewells, on the 2 of October we started our trip leaving New York behind. We went out to open seas and down the New Jersey coast until Delaware Bay. Our plan is to join the ICW crossing the D canal. We arrived at the entrance of the D canal before sunset on the second day and found a very nice and quiet anchorage where we spent the night. Very early next morning we motored across the D Canal and entered Chesapeake Bay sailing towards Annapolis where we arrived before sunset. Our first leg over, we get ready for a hectic week at the boat show. We have a very long list of things we want to buy to get Zenitude ready for the coming season. We made the decision to stay in Kent Island Narrows to avoid the crowds of the boat show and were able to get a berth at the Kent Island Yacht Club. The people at the Club are very nice and as long as you are member of another club you can stay there for a relatively convenient fee. It was a good decision. We rented a car and even if we had to leave early every day to get parking for the show we enjoyed the quiet marina and did not have to stay at a crowed anchorage. Our busy week paid off and we got everything we needed for Zenitude. Veronica and Andrew did their own shopping as well and discovered for us a fantastic place where we bought all our sporting goods. Their visit came to an end and we sadly let them go, they are continuing with their vacation, going next to Montreal, before heading back to Australia. Two days after the boat show is over we leave Annapolis, this time just on our own and after spending a night in Solomon Island we arrive at a boatyard in Deltaville where we plan to have several jobs done and to install the things we bought in the boat show like the water maker, racor filters and xantrex. This is a small boatyard in the town famous for being a large boat building area. We left Zenitude here while we took a short trip home in Sydney. We left October 18 hoping everything should be ready on our return. It didn't happen. We came back on the 24 and what a shock. We arrived after business hours to find all work about half way done and everything upside down inside Zenitude. To make things more depressing it was freezing cold. Next day we moved to a cute and warm bread and breakfast and things started to look much better. We found the people in Deltaville fantastic and soon all jobs were completed, Zenitude was ready and we left towards warmer latitudes. Leaving Deltaville very early in the morning we continue our way down Chesapeak Bay and at the end of the day we enter the ICW at mile "0", Norfolk. We found it impressive to be sailing next to huge naval ships and after taking many pictures arrived to the anchorage next to the Naval Hospital. We found it was a very quiet anchorage in a beautiful night. Portsmouth Naval Hospital is to starboard as you pass red lighted bouy "36" on the way south. Anchor here as close in as your draft will allow (tide is about 3 ft.). The bottom is good holding. This is a popular stop before continuing down the ICW, in spite of the wake created by the heavy commercial traffic. There is a marina with fuel, a restaurant, and a store. The rest of the trip inside the ICW was spent between enjoying the views, waiting for bridge openings, finding good spots to spend the night and trying really hard not to run aground. Of course we didn't succeed on the last one. It is a common say that in the ICW it is not a matter of 'if you will run aground', the matter is 'when you will run aground'. Even then it wasn't too bad, we did run aground twice but managed to float again and keep going. The second time the autopilot pull out of place and with some advice from our friend John and some technical reading Oscar managed to fix it. We decided to do the last part of the trip out to sea. We were longing for the freedom of sailing without the restrictions of the ICW. We had a good run for the first part of the trip until a nasty wind started to blow from the west. 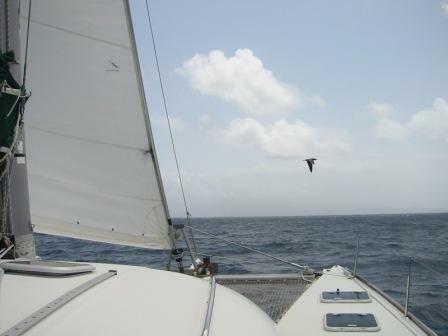 We painfully made the last miles until we entered the ICW again in the St. Helena sound. 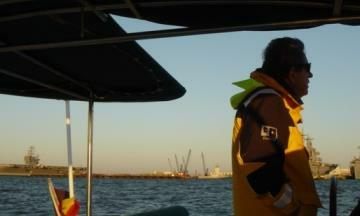 Day light was just breaking and we decided to anchor to wait for a most suitable time before calling on John's house. We did the last couple of miles with John's directions over the phone and finally arrived to his dock. 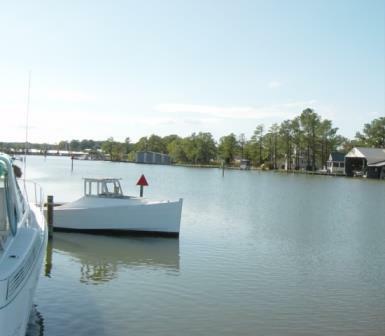 John and Mary Ellen's house is right on the ICW, on Factory Creek. They were anxiously waiting for us and gave us the most cheerful welcome. We chose what looked like a nice peaceful spot and all was good until the time we lift anchor. That's when we realized our mistake. There was a very strong current in opposite direction to the wind. This was the first time we anchored in such a strong current and needles to say we were lucky to be able to get out of the spot without fouling the anchor.